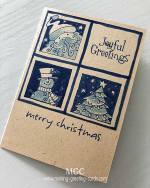 Santa Christmas Cards are attractive and especially with Santa Claus, Father Christmas - the merry gentleman in his red robe and cap, the feeling of Christmas is immediately felt when one receives a Christmas card Santa. 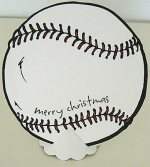 Whether Santa alone on the front of the Christmas card, or Santa with his sack of gifts or Santa Claus with his sleigh and reindeers dashing across your homemade Christmas cards - your recipients will definitely feel the spirit of Christmas when they hold your paper Christmas card in their hands. Do you know who's the reindeer at the head of the sleigh? Ha! Ha! Rudolph, the reindeer with his red rosy nose! And his gang? They are Dasher, Dancer, Prancer, Vixen, Donner, Comet, Cupid and Blitzen. 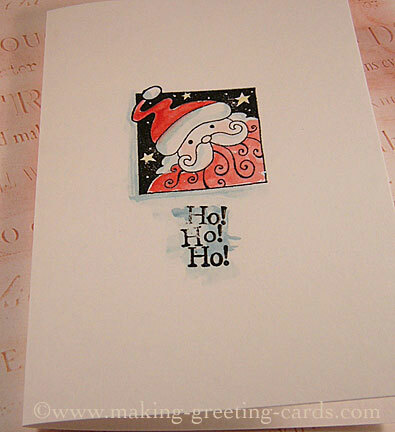 Here are two simple Santa Christmas greeting cards I have made. Both are rubber stamped cards. I used mostly Hero Arts clear stamps for this year Christmas cards. Take a look! 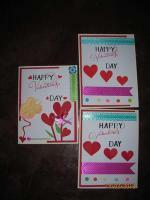 I love to use 220 gsm Parchment White card stocks for making greeting cards. 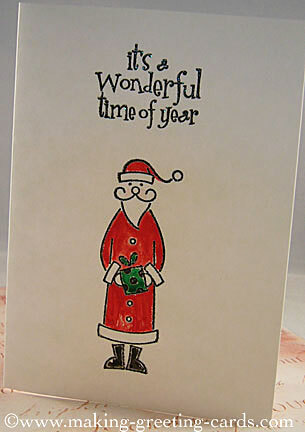 And for this Santa Christmas card project, I find that the white cards look especially great with Santa images. For this first Christmas card Santa design, I stamped the chubby Santa's image with black pigment ink and heat embossed with clear embossing powder. Then add the "Ho! Ho! Ho!" rubber stamp message with the same black ink and heat emboss. Finally, I colour the image with watercolours. Red, blue and yellow are the three colours used. As you notice, this is a rather slim Santa and he only got one present in his hands - no bagful of gifts around his feet. Well, I like him. I imagine when my friend opens this homemade Christmas card, she will feel like Santa's standing at her door bearing a gift specially for her. And the stamped message is "it's a wonderful time of year". Indeed, it is. I love this time of the year. I gave the same treatment for this card design. Stamped with black pigment ink and heat embossed with clear embossing powder. Then watercolored them. Only two colors used here - traditional red and green Christmas colors. That's it! My two Santa Christmas cards. Now to make more of them. 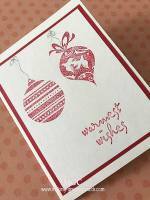 Note: You can go to the Card Verses page to choose a Christmas wording or Christmas Scripture verse to add to the inside of your card.